It's quite exciting that the London Olympics will commence in just three more days isn't it. 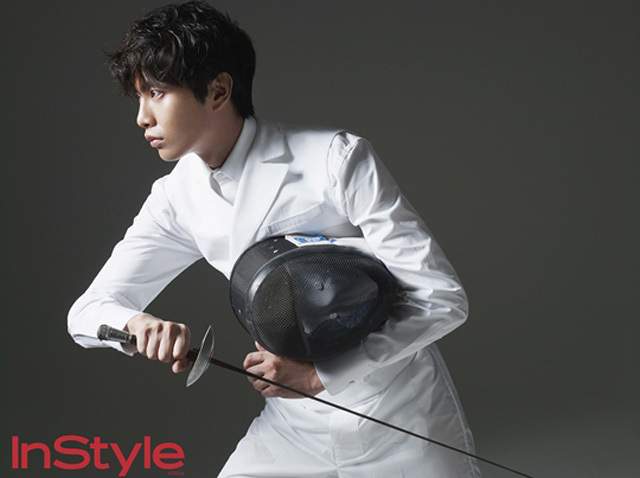 InStyle Korea celebrates the games with a special August issue that features various male celebrities representing different sports along with their messages of personal encouragement to the participating athletes. 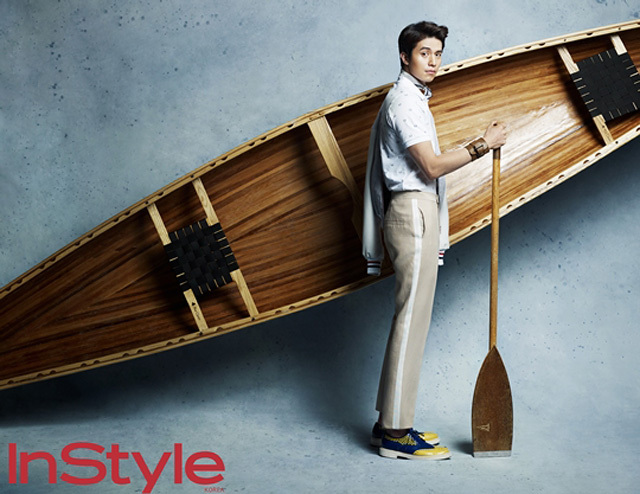 Lee Dong Wook pictured above captures the spirit of canoeing while looking stylish. I found the photo of Lee Sun Gyun whose sport is shooting a tad odd as I don't know what a cat has to do with the sport or why he's sitting by a crate in house slippers with a cheeky expression. It's fun though. 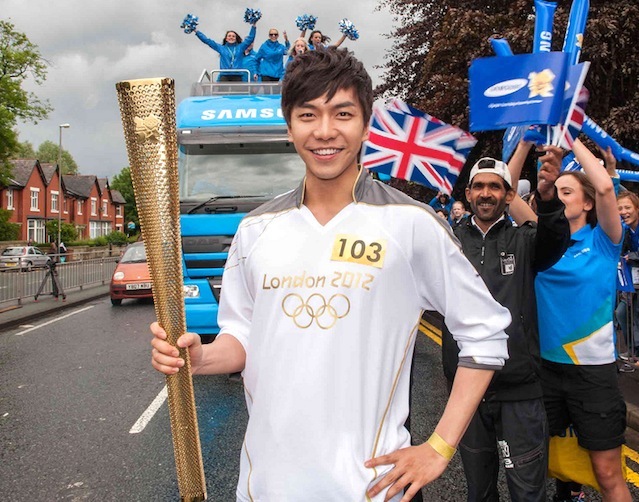 In other Olympic related matters, I had previously talked about Lee Seung Gi serving as an official torchbearer for the games and he did it. The singer/actor carried the flame at Rochdale near Manchester in the UK on June 23rd. He ran 320 meters from Stratford to Manchester Road Avenue. I'm so excited! Speaking honestly, I don't think Portugal is going to win anything, but I'm looking forward to see gymnastics and diving! These photos are really great. The first one is just perfect. Love these outfits too. Wow, Rowena, fantastic editorial, and definitively eye caramel, hehe! 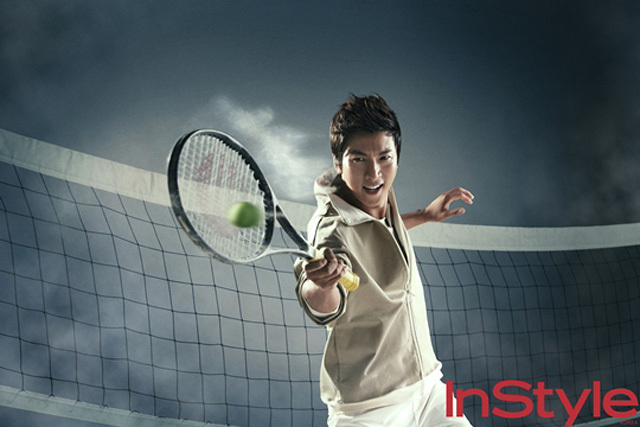 I like especially Lee Jin Wook, the handball player, he has tons of attitude, in a sassy way, don't you think? You always have the best eye candy!! I'd never have known about these cuties if it weren't for your editorial features. I like the way they took the sport theme and turned that into art photography. Yaaay! I'm so glad you're putting that pic on Etsy! I'm definitely buying it. These are cool how they incorporate sport and fashion. I used to watch Olympic when i still lived in Asia, now i dont watch any at all. Dont know why. The first pic is my favorite..the model of course..hehe. Great men's editorial. Daring and sporty. Nice post Rowena! I like the styling of the photos. Have a great day! Ahh I like Lee Seung Gi!! And this spread is adorable! I'm so excited for the Olympics! What a fun editorial! Thanks for sharing doll... I think everyone is excited for the Olympics... but i must admit i'm relieved to not be there - the chaos it's causing all over London is insane! Hope all is well or getting better for you treacle. p.s thanks for your comment. This Olimpic Style is so chic!! Great! Love this photshoot... Wish I could go and check how London is doing...must be so much fun! Haha...that handball pic is awesome! XD Can't wait for the Olympics!! Thanks for posting this Rowena! Cute guys and some great pictures. How exciting! Let the games begin! That cat/gun/wooden box photo is so confusing maybe the cat photo bombed the shot? The rest of them are nice though. The color and simplicity is great! I can't believe you have had no cold things. I can't remember the last time I had something hot, especially in the summer but if it works then I say, do it! :) I made an exception for ice cream ban last summer if it was purchased at a stand on the side of the road. Bonus points if there were actual live cows involved. I drink iced coffee in the winter because the ice doesn't melt and when people question it, I tell them I'm drinking it to warm up. I actually like spring and fall best though. Yes to the witch doctor. Beets seem to be the key to success. That and some kelp powder, carrots and some other things. It's not a cure but I'm definitely better so that's good! I could totally see the wool items in a drama. One where they aren't in the city though. Seriously why is the cat on the crate? It is a fun picture though! Haha you always find the cutest guys Rowena! I hope that you are feeling better and having a wonderful week so far! The tennis player...HOT! I am super excited to watch the olympics tonight! It's going to be an exciting event, and I can't wait to see the UK team's uniform...designed by Stella!!! Lol that second pic with the cat and gun is really a little odd. But great eye candy indeed! great pictures! I love the olympics! I have been watching the Olympics non stop. These photos are so fun and the guys all look GREAT. The cat and gun photo is a little wild, I agree. Haha. Oh my gosh, oh my gosh, this is such a perfect photo shoot! Thank you so much for sharing it - I saved the piccies. :D Lee Sun Gyun ( aka THE VOICE! ) is too perfect. omigosh i didn't even know seungki was a torch bearer, i can't deny his dimples. eesh my weakness for dimples. i liked lee sun gyun ever since i saw him in coffee prince, and his voice, this is serious eye candy post. and Lee Dong Wook....doing his thang.